GTBee is a super-simple to-do list app with a sting. It's great for short-term, one-off tasks that might not be quite worthy of a full-fledged Beeminder goal. Right now it's only available for iOS, but an officially-supported Android version has long been wished for. With GTBee, you create to-dos with a pledge attached. You'll need to do the task and check it off before time's up, or you'll get charged your pledge amount. Like regular Beeminder derailments, we'll send you an email 24 hours before the charge is processed in case it was an error or a mistake. How do I get GTBee? Download the app from the App Store. Open the app and connect to Beeminder by logging in with your Beeminder account. How do I create tasks? Press the Add Task button at the bottom of the screen to create a new task. Give it a name by tapping on Enter task description at the top of the screen. 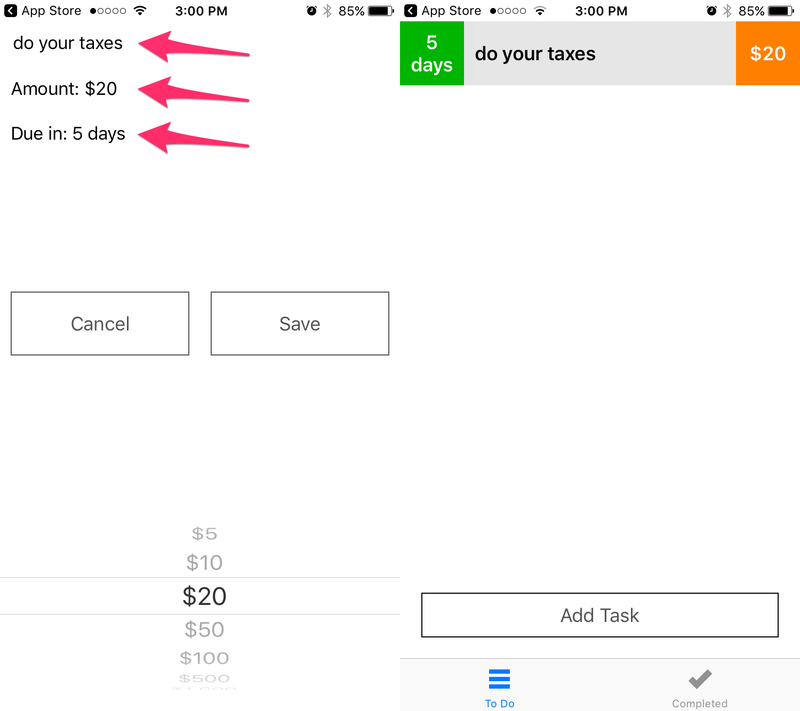 You can adjust the amount at stake and the task deadline by tapping on those fields below. Press Save to submit the task. It'll now appear in your To Do list. How do I get reminders? Upon installing or reinstalling the app, GTBee will prompt you to enable notifications. If you don't allow notifications, you won't get them! You can turn them on or off any time using iOS Settings > GTBee > Notifications > Allow Notifications. The notifications are delivered when your task has 24 hours to go, and then 12, 6, 2, 1 hour, 30 minutes, 10 minutes, and 5 minutes. Unlike full Beeminder, this schedule is not yet customizable, but should still be plenty annoying to remind you to get it done! Swipe left to complete a task with the green ✔, or trash it with the red ✘. If you've completed it, it will be stored in the Completed list (tap the bottom of the screen to switch between To Do and Completed). When you don't complete your task, we'll send you an email with the information and schedule a charge, just like a regular Beeminder legitimacy check. 24 hours after that email is sent, the charge will be processed. Reply to the email if there were any problems with the app or the task!